With the whole Neapolitan pizza craze leveling off in the last few years, there have been fewer joints entering the fray. 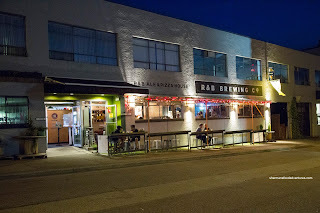 There are the occasional new players in town such as Firecrust and the newly opened Assembli, but for intents and purposes, the current "it" item is shaved ice. 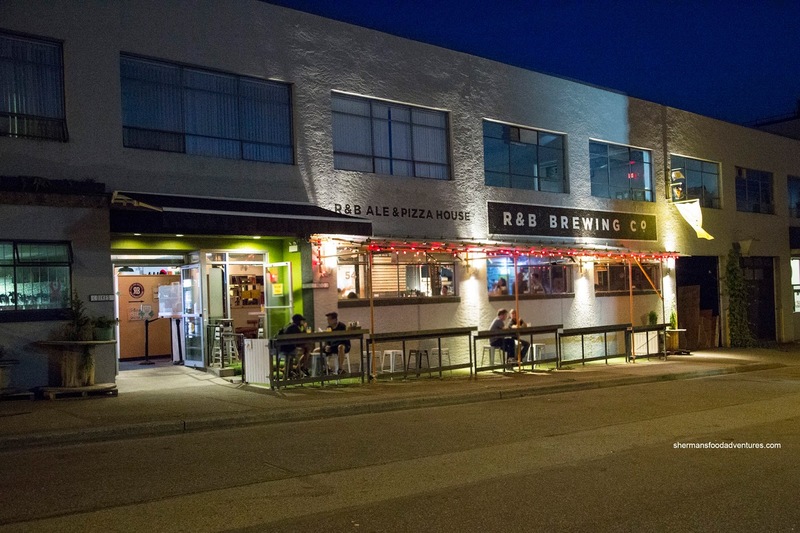 R&B Ale & Pizza House opened up shop rather quietly last year and honestly, it wasn't even on my radar. 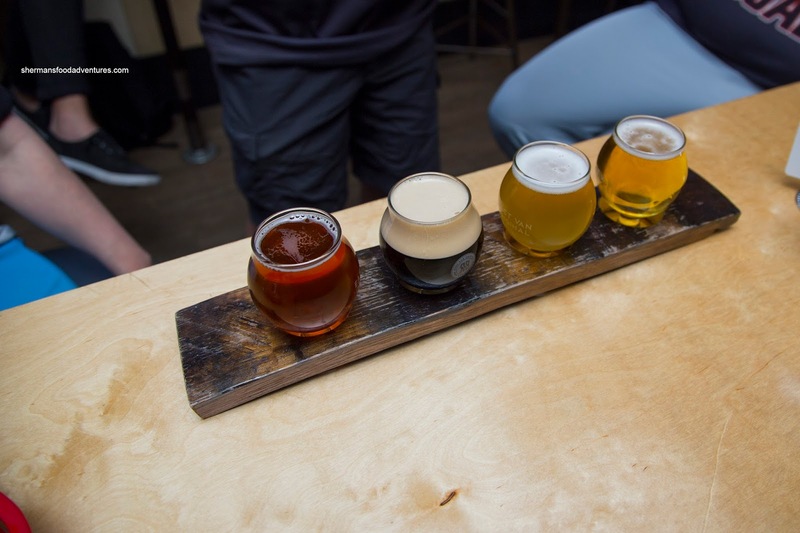 How good can the pizza be at a brewery anyways? Well, we decided to finally check it out after Monday night softball at nearby Strathcona Park. With an understated store frontage and an equally utilitarian interior, we weren't high on our expectations. What immediately caught our eye was the extremely reasonable pricing where the veggie pizzas were $10.50 and the meat ones were $12.50. 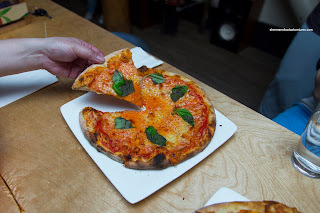 We began with the standard being the classic Margherita. The lightly charred crust was uniformly crunchy throughout while the inside was chewy and mildly seasoned. We found the tomato sauce to be balanced and quite flavourful while the mozzarella was adequate. I personally would've liked to see the basil put on top after baking. Of course we didn't only eat pizza, so I got their Shake Yo Fruity IPA. Normally, I hate fruity beer, but this one was actually quite good with an almost floral quality with only mild hits of tropical fruit. It went down smooth and was lightly hoppy. Probably our most favourite pizza, the Crispy Prosciutto with arugula and shaved Parm had a great balance of flavours. There was enough prosciutto for saltiness and body while the arugula did its bright and bitter thing while the shaved parm added another layer of nutty saltiness. Normally, this type of pizza can be on the drier side and overly salty, but this one had enough moisture and was flavourful without being overwhelming. Combined with the same uniformly crunchy crust, this pizza ate quite well. 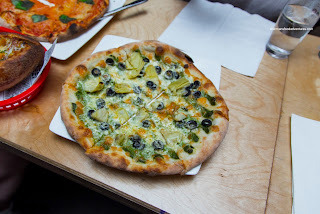 Another surprisingly good pizza was the Pesto, Artichoke and Black Olive. Again, with both artichoke and black olive, these type of pizzas are often salty. 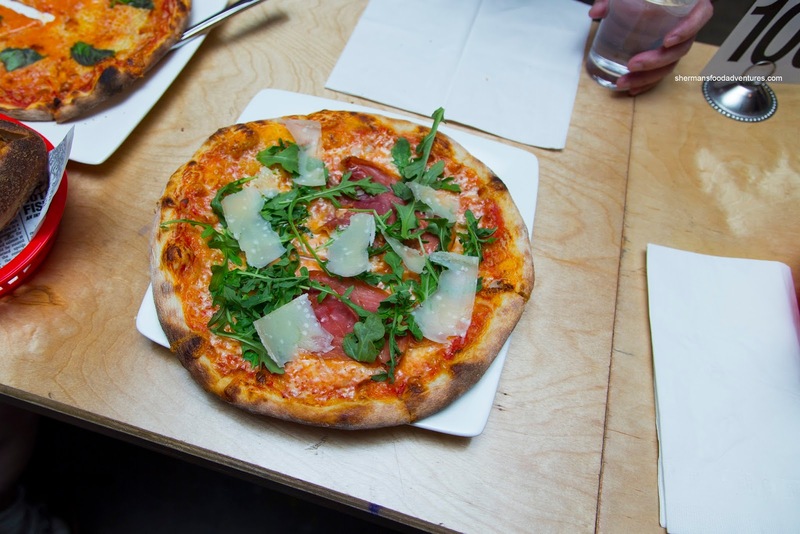 Similarly with the prosciutto, this pizza was balanced with impactful and noticeable flavours without going overboard. The ample amount of cheese seemed to help things too. 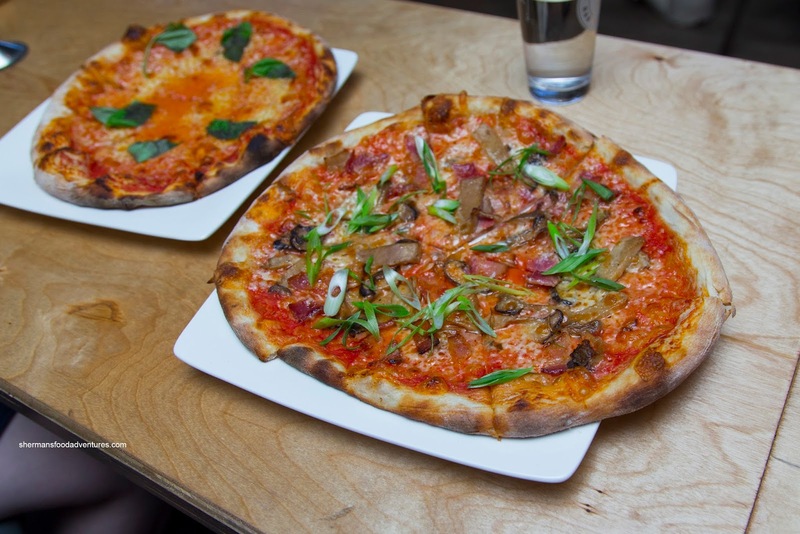 Our last pizza was the Bacon & Mushroom sprinkled with green onion. Tasting exactly like its description, there was the saltiness of the bacon meshed with the Earthiness of the mushrooms. I would've liked to see the bacon more crispy, but it wasn't chewy nor fatty either. Again, there was enough cheese to bind everything together, but we would've liked to see a bit more sauce. As much as the pizzas weren't too dry, the crunchy crust could've benefited from some more moisture. 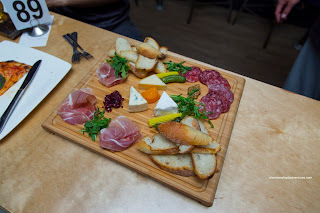 Generally, I do not order Charcuterie Boards since they are not exactly super-exciting. However, Bear decided to go for the $15.00 board consisting of salami, prosciutto, blue cheese, gruyere and brie accompanied by pickles, grainy mustard and sourdough crostinis. Not bad and decently priced. 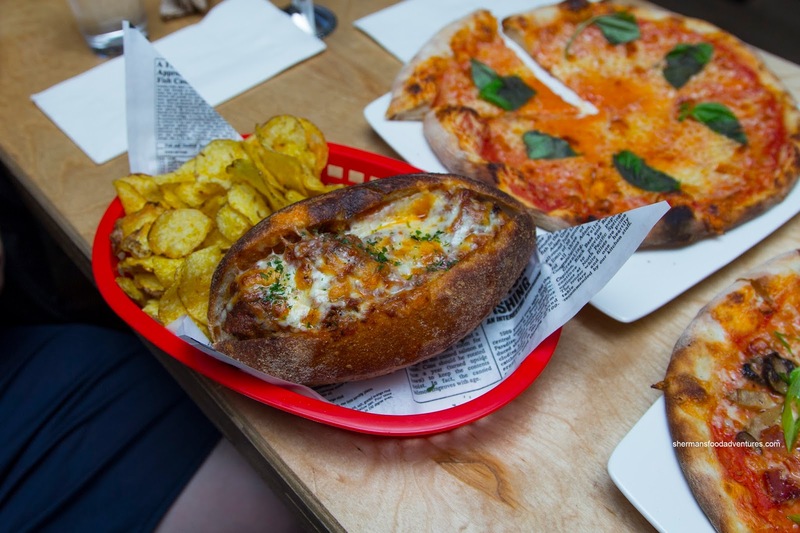 Milhouse and I weren't satisfied with pizza alone, so we added both the Pulled Pork and Meatball Sandwiches with kettle chips on the side. Both were baked in what looked like a Portuguese bun and topped with melted cheese. Although priced at only $10.00 each, these ate better than many versions costing a half more. The pulled pork was tender and aggressively sauced being sweet and really cheesy. 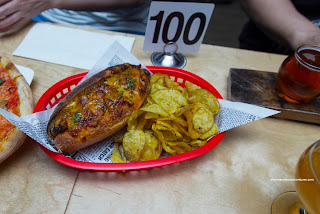 Tucked in a soft crusty roll, this ate very pleasingly and was delicious. The meatball was crumbly and soft while aggressively seasoned with Italian spices including plenty of oregano. There was also a noted spiciness as well. The side of kettle chips were fantastic being crunchy and lightly salted. Surprising. That is probably the only way to describe our visit to R&B. The place doesn't look like much, but the food is actually decent and best-of-all, inexpensive. - Decent eats, loved those sammies!